After some mediocre weather the forecast was set for a short weather window with a stormy deterioration in the late afternoon. 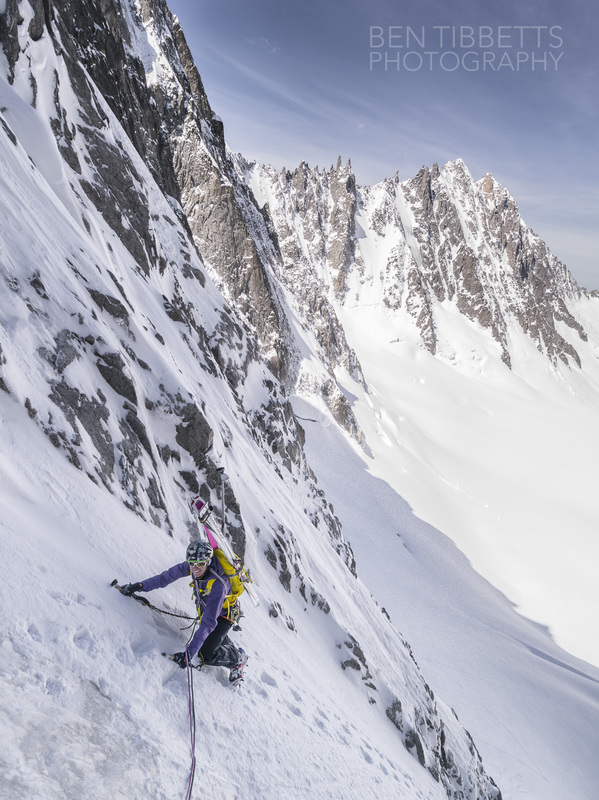 Valentine and I headed up the first lift of the Grand Montets with an open mind, but with the hope of climbing the Charlet route on Mont Dolent to then ski the South face back into Italy. Mont Dolent is often a somewhat neglected as the summit is either a long way or tricky from any access point. It is however a rather shapely peak that forms the border of France, Italy and Switerland. It was a slightly ambitious plan considering the weather window, but easily possible in good conditions. I didn’t know Valentine particularly well. I had however made the tacit assumption that she would either be fine with the idea, or suggest a better one. 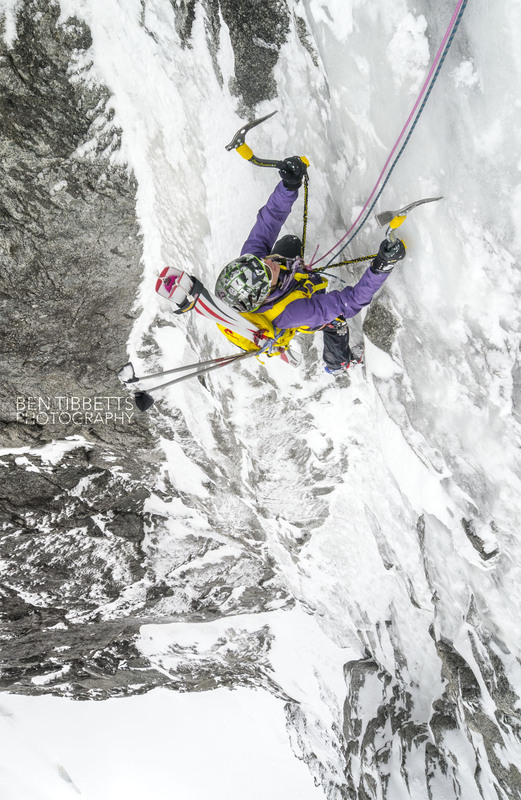 We had met through SkiMo racing, first in Andorra, then at the Pierra Menta and Tour du Rutor. 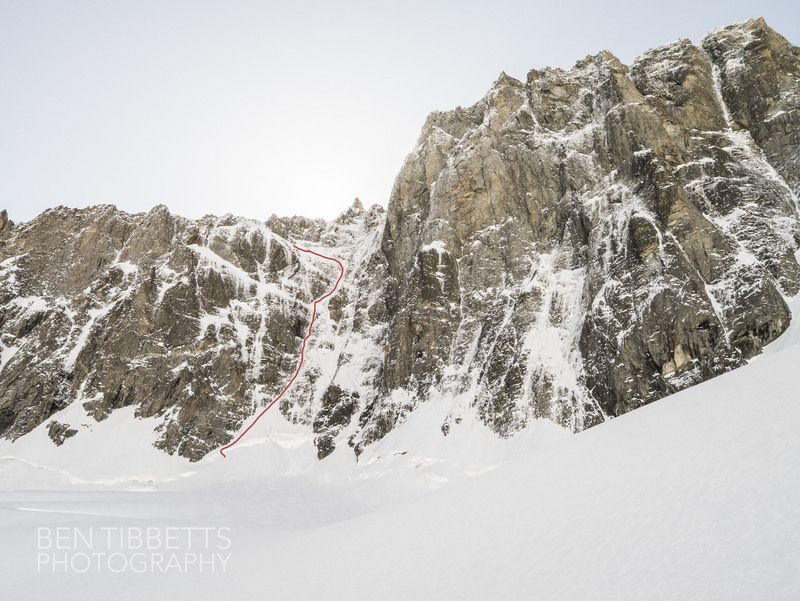 The North Face of Mont Dolent, very foreshortened, showing the variation couloirs of the Charlet route. Despite a starting from the earliest lift (8:30) it was already 10:30 by the time we reached the bottom of the route. 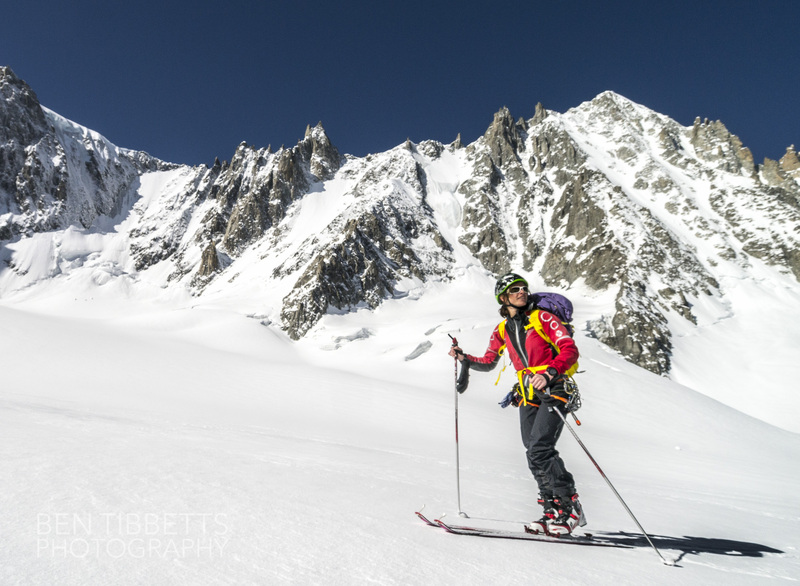 As we approached it became pretty evident that like most others in the Mont Blanc massif at the moment, the routes around here were pretty dry. Valentine sensibly asked whether we should bother climbing with the skis as and descending the other side now looked unlikely. However I thought there was still a chance so we took them anyway. 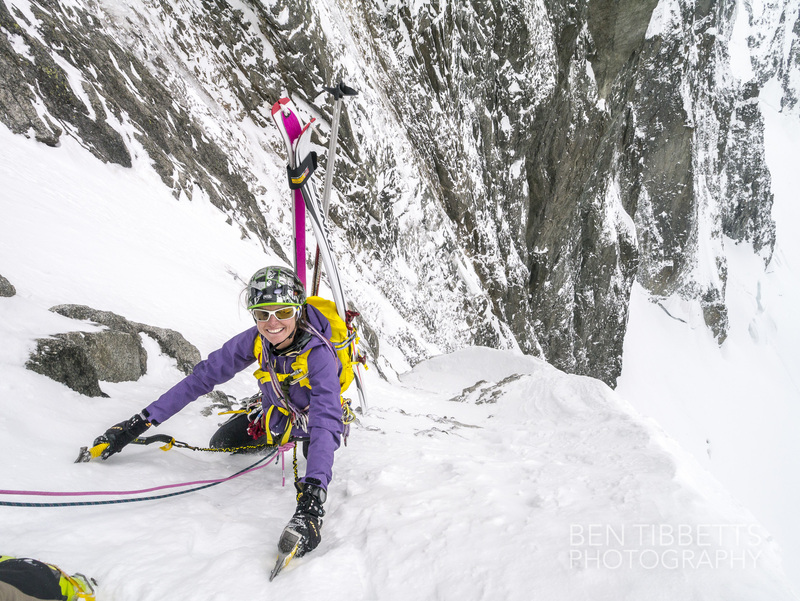 I had run a few easier pitches together climbing simul and then took a belay. Not knowing how Valentine climbing I asked vaguely whether I should carry on. She looked at me intently and said something like “Tu as peur de ce que je suis capable de faire? !”… i.e. are you worried about what I can do? err, no… I looked sheepishly at her and handed the gear over…! 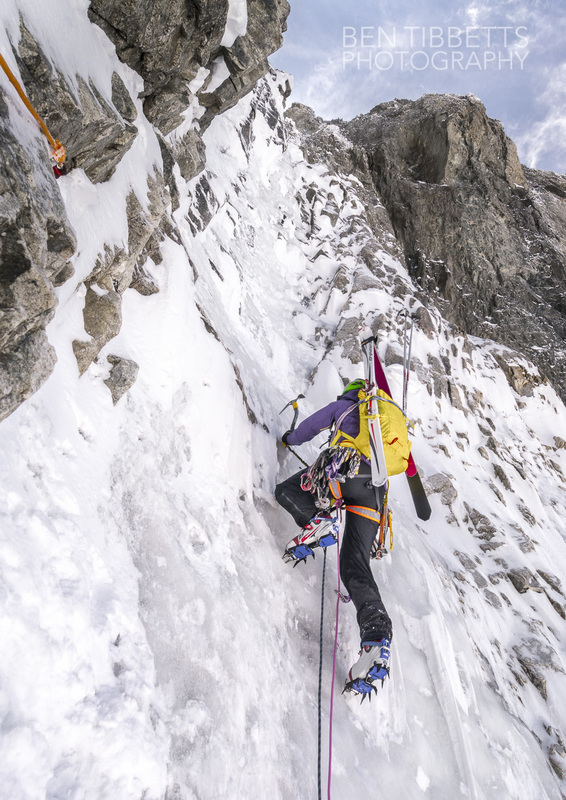 Pretty soon the route kicks up into a series of icy runnels and grooves which provided fun and interesting climbing. Albeit with thin and brittle old ice at the moment so rather poorly protected! 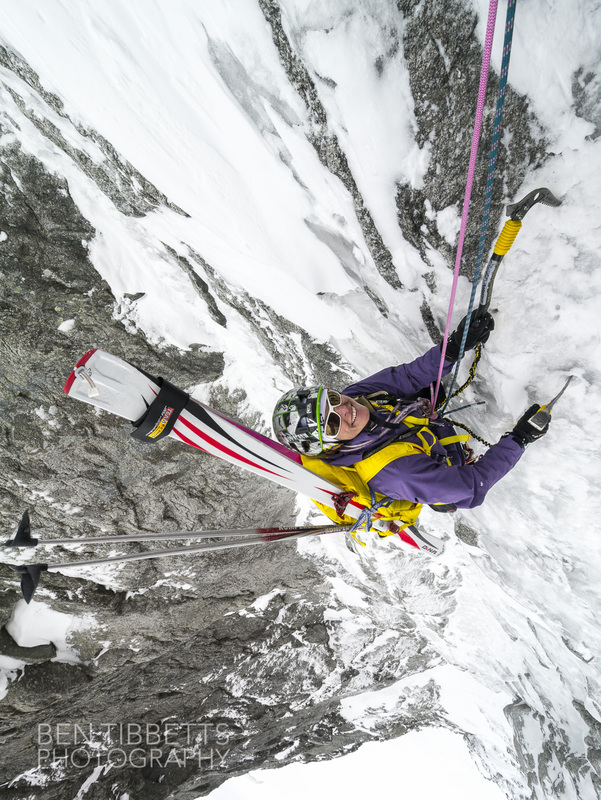 There are a series of piton anchors in place to rappel from so pitch on pitch the route isn’t particularly committing. Despite not being particularly hard, it was delicate and pretty slow going. In these conditions we should have got the hint and left the skis at one of the anchors… instead we carried on with them rattling off the rocks! By about 2pm we had got up much of the steeper ground, but clouds were already beginning to gather slowly to the west. It was obvious from here that we were on a left hand variation of the Charlet route (called Couloir Variations in the guidebook), which continued out left to the ridgeline. 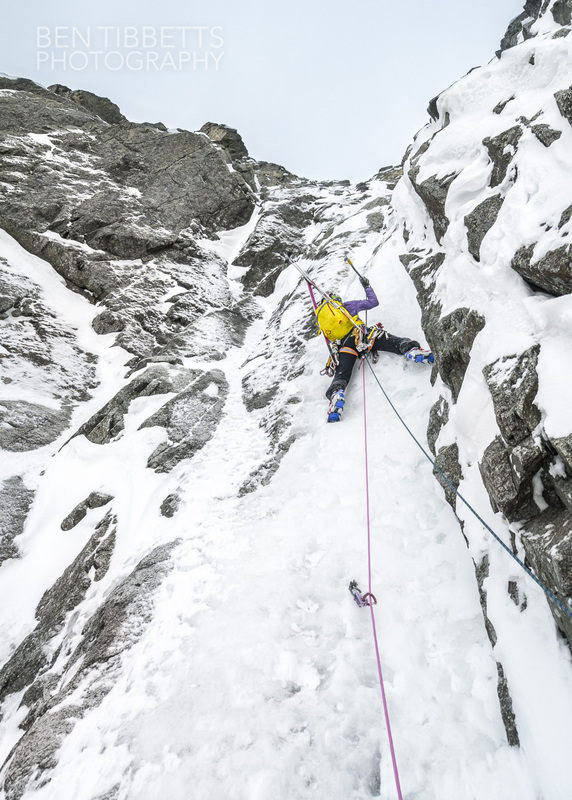 The main Charlet route carried straight on, but despite an easier angle, was largely devoid of ice and on compact granite slabs! 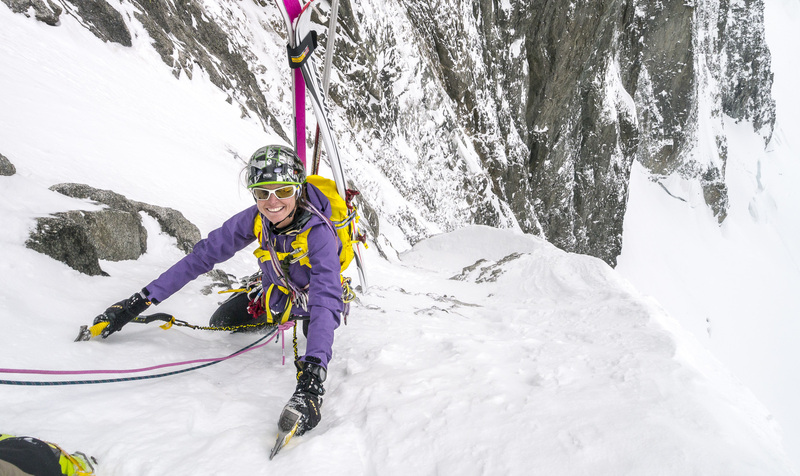 Valentine suggested we think about turning around and starting to rappel. 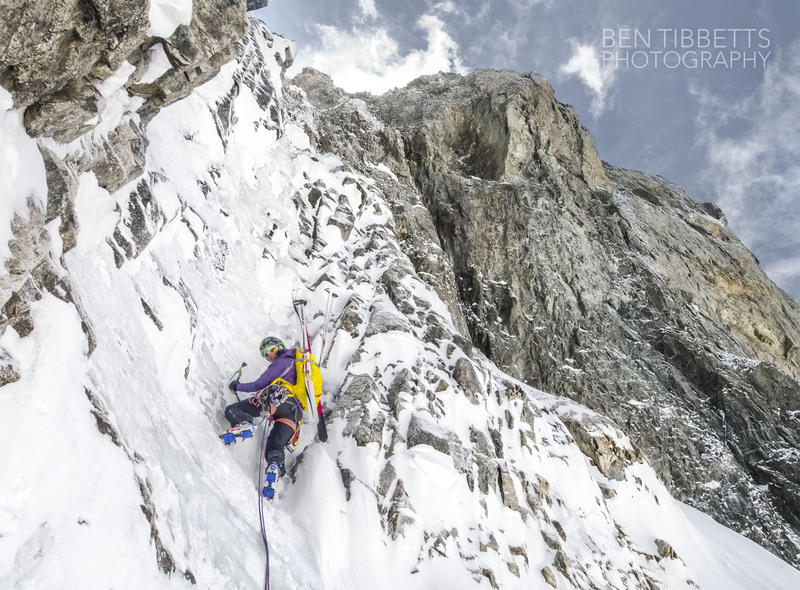 I was pretty keen just to get out left onto the ridge and see the top of the variation route. We carried on up a few pitches moving together and then called it a day. It seemed that from the point that we reached just before the North ridge, the summit could be obtained fairly easily along the ridge. Nevertheless clouds were gathering quickly now and it was certainly time to head back down rather than get caught in a storm. When we reached the glacier and got skis back on the clouds had enclosed the whole basin and we skied down following our tracks back through the mist. The snow was wet and slow going, and as we dropped down it began to snow in big wet flakes, then sleet. We hit the pistes and charged down to the Lognon / mid station, but our chips were up as the first thunder claps broke overhead. 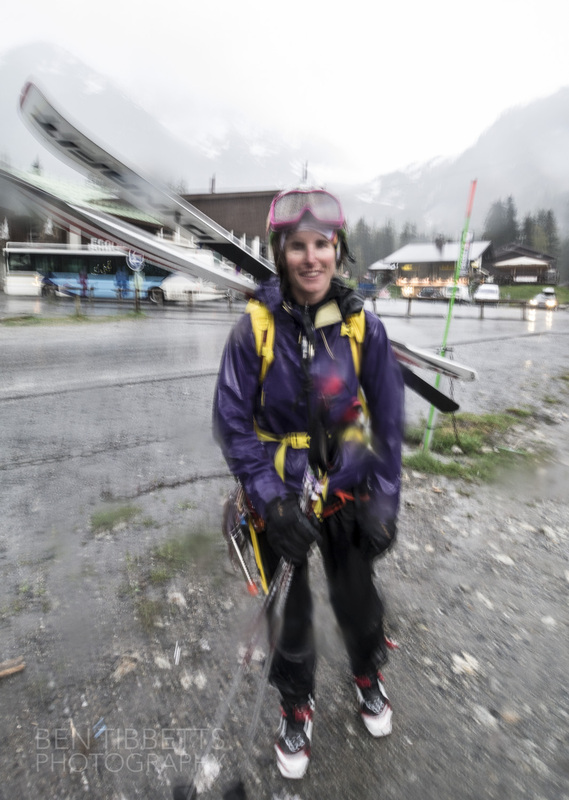 Within minutes we were in a torrential downpour, waterskiing down what remained of the Pierre a Ric (Grand Montets home run), rattling over slush, pebbles and muddy snow, then eventually walking back like drowned rats to the car! I quite enjoyed the soaking, as it was warm and we were well off the mountain… nevertheless if we had turned around where Valentine suggested I doubt we would have gotten wet… Sorry! Seriously cool woman alert! Stick with Valentine she will keep you alive nicely!